Good old Saint Nick. He makes toys all year long in one of the most inhospitable places on earth, and what does he get in return? Two things: the knowledge that he makes a lot of good boys and girls very happy, and several thousand tons of milk and cookies. We will leave the matter of which is better, charity or cookies, to debate, but in Santa’s case it’s fortunate that he doesn’t have to choose one over the other. We all know and love Santa’s signature look. But did you know that Santa’s suit does more than just make him recognizable? Have you ever flown at several times the speed of sound at high altitudes in an open sleigh in December? It gets a little chilly, to say the least. That’s why Santa opts for all that extra fluff on his suit’s trim. Furthermore, visibility is always a factor. The last thing Santa would want while he’s en route to El Paso is to have an unfortunate run-in with a jumbo jet. Fortunately, his rich red suit is very visible to pilots, and they swerve away accordingly. This might upset the first class passengers’ drinks, but they all understand that Christmas is more important than their Rob Roys. 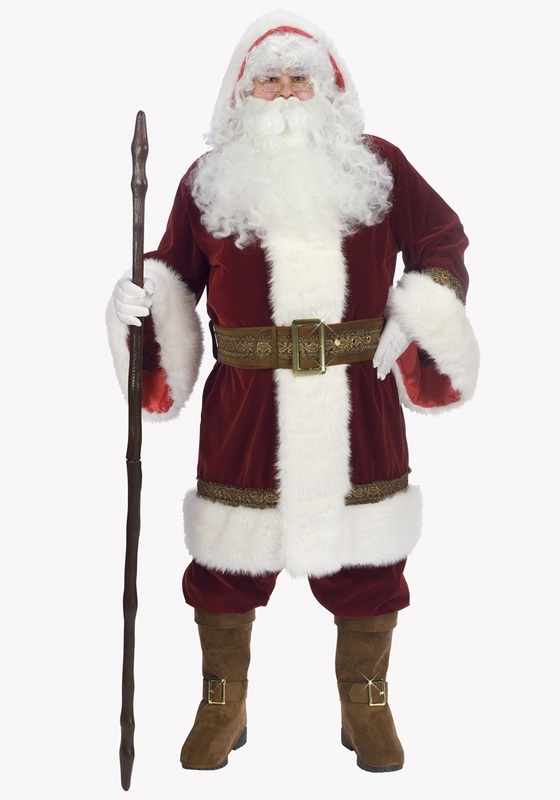 With the brilliant and detailed Deluxe Old Time Santa Costume, even the skeptics will know in their hearts that they just met the legend himself. From the intricate belt to the suede-like boot tops, no accent is spared in this ultimate Santa outfit. The looks on their faces when they see you in this will make you smile ear to ear -- and the cookies they give you won’t hurt either! This suit is actually well made, it is lined and would hold up to wear. However, arms are extremely long...like a foot too long for a normal sized man to wear. It just didn't look right. I purchased this same style Santa Suit 2 years ago. It was made of more plush velvet, but the seams started to split apart after a few wearings. I have had it repaired twice, because I love the suit. So many, many complements. The new suit is not as deep a burgundy and not as plush as the older one, but is made of much stronger materials. I expect it will hold up better. I do Santa over 30 days per year, so I want a nice suit with durability. I highly recommend this item. It appears pricey, but it's the real deal. I just ordered a third one for spare, as it requires dry cleaning.